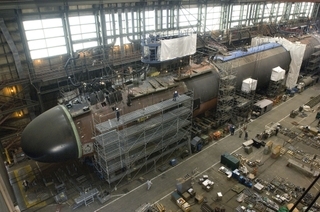 NEWPORT NEWS, Va, May 19, 2008 (PRIME NEWSWIRE) -- Northrop Grumman Corporation's (NYSE:NOC) Shipbuilding sector reached an important construction milestone May 18 when it completed the final hull welds of the Virginia-class submarine New Mexico (SSN 779). This accomplishment, known as "pressure hull complete," signifies the hull sections being joined to form a single unit. It is the last major milestone before the ship's christening later this year at the company's Newport News, Va. facilities. Photos accompanying this release are available at http://media.primezone.com/noc/. A photo slideshow is available at http://www.nn.northropgrumman.com/vcs/ssn779phc/. Northrop Grumman Shipbuilding, a newly-formed sector of Northrop Grumman, combined the former Northrop Grumman Ship Systems and Newport News shipbuilding sectors. "Pressure hull completion is a major milestone in the shipbuilding process. She's starting to take shape now - it's a significant accomplishment and a proud occasion for all the folks who are constructing New Mexico," said Becky Stewart, vice president of submarine program for Northrop Grumman. "We're on track to deliver the ship eight months ahead of schedule. That's a testament to our shipbuilders who have taken ownership of our goals and are involved in process improvements, which allow us to meet our quality, cost and schedule commitments." New Mexico, the sixth ship of the Virginia class, is named for "The Land of Enchantment." Upon delivery to the Navy in 2009, it will be the most modern and sophisticated attack submarine in the world, providing undersea supremacy well into the 21st century.